I've been lucky enough to take part in a study aimed at understanding how to make websites more accessible for users with Intellectual Disabilities at the Rix Centre, University of East London. On the final day an expert panel were invited to give their thoughts. Here are some brief notes from the speakers. Before a Q&A each speaker had five minutes to give their opinion on how to make sites more accessible to Intellectually Disabled Users. Here is a list of the speakers and their main points. I’ll be posting again about my learning from the study shortly. What should you prioritise? What would be the one thing to do? Generally there is no magic bullet. There is no testing tool that will do the trick. User testing is key particularly for this group of users. Tools can tell you about document structure and alt tags etc but for Intellectually Disabled users these kind of tools are not so good. User testing is key. 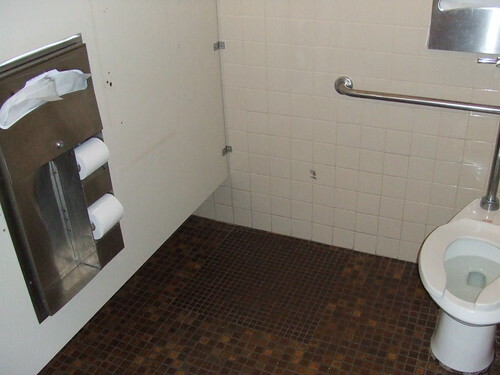 Christian Heillemann’s picture of a toilet shows that you really need to user test every site that you build. You should not just follow guidelines but understand, test and interpret them. Anne showed Christian Heilmann’s example of an accessible toilet found in London. It is totally unusable. It is very difficult to say what the one thing you should do to improve accessibility for intellectually disabled users as it is a very complicated subject. The internet has become a very big thing that means different things to different people. Who are you designing for? What is their concept of accessibility? The commissioners of the site vary as to the level of accessibility they want to achieve. Target is moving a lot. The target in terms of the people is equally as wide, from someone who struggles a bit to read to someone who won’t sit down in front of a computer screen. In my experience it is not that they can use the website themselves but rather that someone can sit with them and work through things together. For that reason a hook where a facilitator can make it happen is important. Keyboard control over being able to use the website. Websites are often way beyond the level of ability of intellectually disabled users. How symbols can enhance accessibility. Research shows that symbols improvs the readabiliity of a website. Speech and symbols give the best results, followed by speech followed by symbols. 70% of special schools use widget reference symbols. Many people come through education using symbols, then don’t have access to resources. When symbol content is provided they use it. Symbol world gets 35,000 unique hits a month. Labour Party manifesto was symbolised and subseqently crashed Symbol World’s servers. Demand is there. Symbols also help foreign language speakers. Good for struggling readers and people learning to read. English is also simplified by people using symbols. You can just using simples for navigation - example. You can also symbolise summaries of the page - example. You can also create full symbol pages. Dynamic content is also possible (Widgit produce technologies to help this happen). Widgit has produced symbol sites themselves and they say if you add symbol support you need to make sure that the symbolised alternative is acccessible from the front page. You need to limit the number of options (more than 8 is a problem, ideally 5.) Layout of symbol content is important. People who read symbols tend not to see punctuation so keep one sentence on a line. Sentences running onto each other is confusing. Too many symbols on a page is a problem. Small menus and split content up into lots of small blocks. Big is beautiful. Icons, pictures, symbols. Five tips. Born out of things happening in Web 2.0. Loads of problems with sites and accessibility for people with learning disabilities. After user testing found that rrows have to be bigger than thought for people with learning disabilities. Come out of your comfort zone if users say so. Anywhere where there is interaction it need to be obvious, and to allow keyboard control. Big browse buttons are god. Debate on whether to make text larger or smaller. In my experience people don’t know. Many are not using assistive technology. The example of Brian, an ID user. It takes him a while to get there - we want him to be quicker, but he is happy to get there at his own pace. Controls need to be bigger. Access - many options to log in sign up. Often lost in links in the top right hand corner. Actions need to be bigger. Sign post them. Help options. They are often too small. Make them big and make them noticeable. When on help pages headings that are big and instructive really help. Give things space within their context or they will get missed. Three themes: Inclusion, Personalisation, Beyond Inclusion. Inclusion - How to make things inclusive. Try multimedia - starter for ten. Same information in different media. Video works for everyone. Don’t forget Web 2.0. Not about people consuming content but they should also be able to contribute. Video is better than words. Many people with learning disabilities love television. Personalisation - example that you can change the BBC homepage. You can turn off a huge amount of the homepage. The BBC has loads of stuff but I want to turn much of it off. I don’t care about history etc. Personalisation is useful in saying if we can’t get everything on there is there a way of enabling the user or the supporter to personalise the site. Beyond inclusion. Create something special. Inclusive design is a good idea but there are numerous places where it doesn’t work. Most things make websites good for ID users but poor for other users. There can be many contradictions. People with ID love images, blind or partially sited people don’t. Symbol world is designed for people with learning disabilities. Do not ghettoise. Content with learning difficulties would want. Produce for them. E.g. Symbol world. Symbol news.